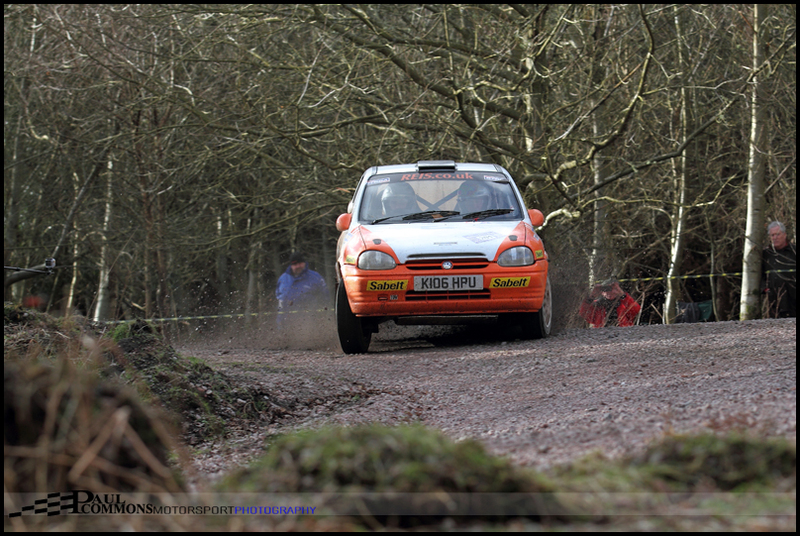 David Bogie & Kevin Rae started 2014 in the best possible fashion by taking a commanding victory on the Wyedean Forest Rally. Meanwhile Matthew Robinson & Sam Collis took the Historic honours and Mat Smith & Giles Dykes claimed top spot in the 1400 category. With the terrible recent weather, I was half expecting this event to be cancelled. I should however have known better as the organisers have history; managing to keep the event on in prior years when faced with sheet ice and several inches of snow! Off to Car Park H we therefore headed for stages 2 and 7. Thoughts of whether a boat would be more appropriate transport than the 4×4 were soon dispelled on arrival as the Sallowvallets stage had held up surprisingly well. Having headed towards the end of the stage last year we decided to go in the opposite direction with junction 6 being the chosen location. 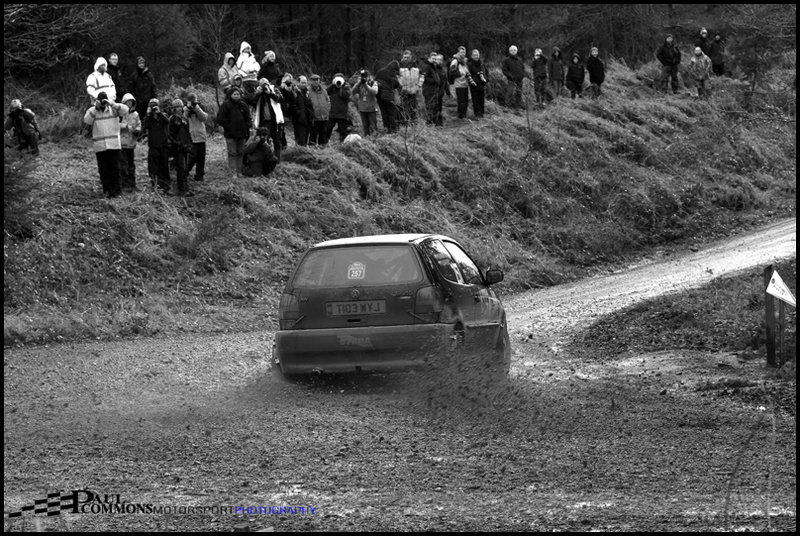 As per usual this event had attracted a large number of spectators with many also headed to this fast 90 right. 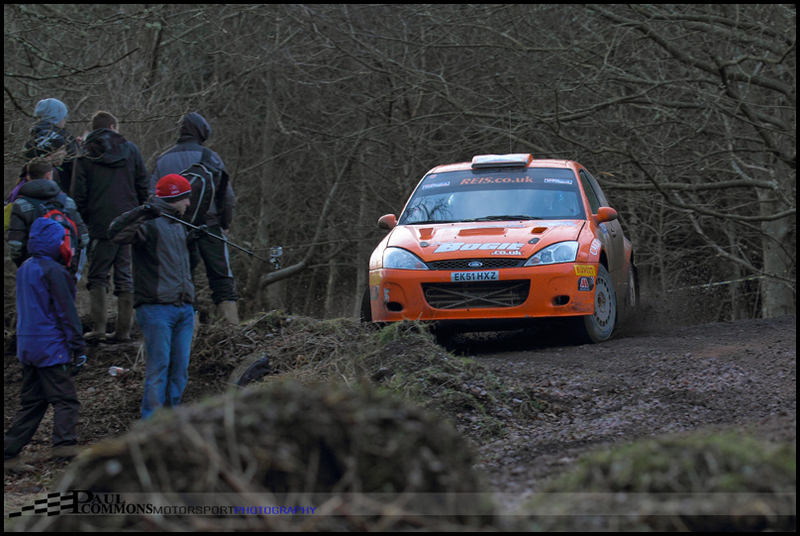 The action however was already underway as the crews headed to Mailscot; the first stage of the day. On paper it was difficult to pick a winner with any of the top 4 focus WRC crews more than capable of taking top spot. Bogie had obviously had his weetabix for breakfast though as his devastatingly quick time of 5.55 was a whole 9 seconds quicker than anyone else. Mat Smith was also on it from the off taking the same margin out of David Bennett in the battle for the 1400 victory. A category which has grown to almost 60 competitors in 2014. Back on stage 2 it was tough conditions for us photographers with sporadic rainfall and light levels changing by the minute. It proved to be a good spot to watch the 1400’s though with some flamboyant driving on display. Dave Brick had few problems transferring his infamous driving style to the little Nova, entering the corner as sideways as humanly possible. The Historic entries were also highly entertaining through this section providing a good opportunity to shoot straight into the sun for a decent black and white conversion. 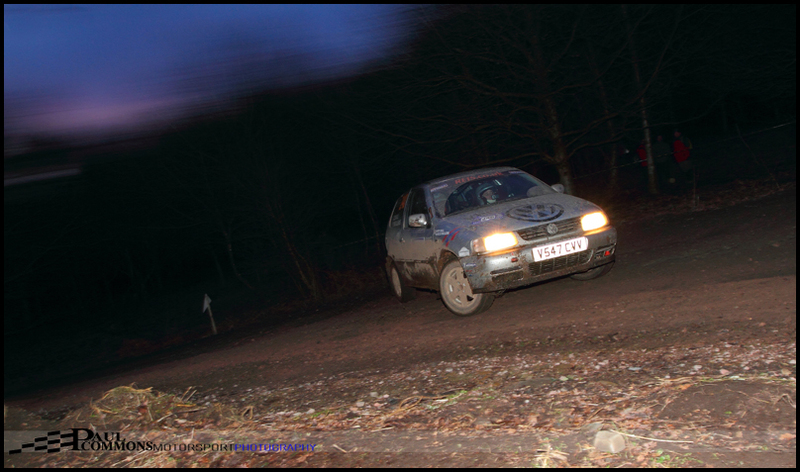 At the front, Bogie was quick again in Sallowvallets and managed to extend his lead by a further 3 seconds over Scottish championship rival Euan Thorburn. The orange Focus was awesome to watch through Junction 6; entering the 90 right almost backwards in similar style to his late great World Champion Countryman. Colin would have been proud. 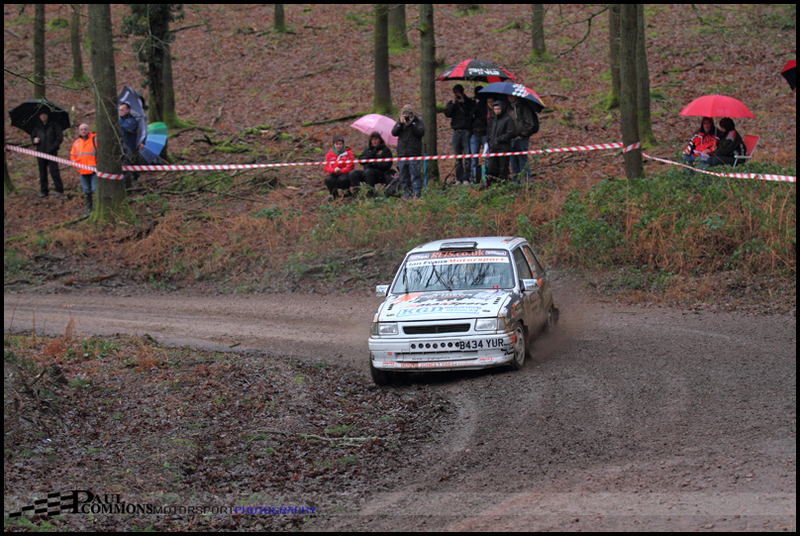 Below, recent four wheel drive convert, Russ Thompson was another star performer at this bend. The light proving troublesome when shooting from the inside but aided by use of a polarising filter. Any thoughts of a Thorburn comeback were soon put to bed as Bogie’s big rival would unfortunately retire on stage 3. 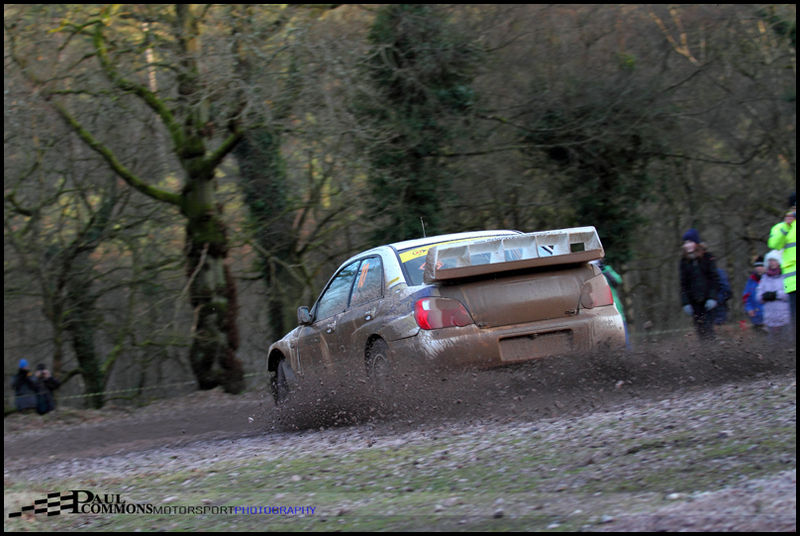 This left the Scotsman with a 34 second lead over the fellow Focus WRC crew of Paul Bird and Aled Davies at the lunchtime service halt. 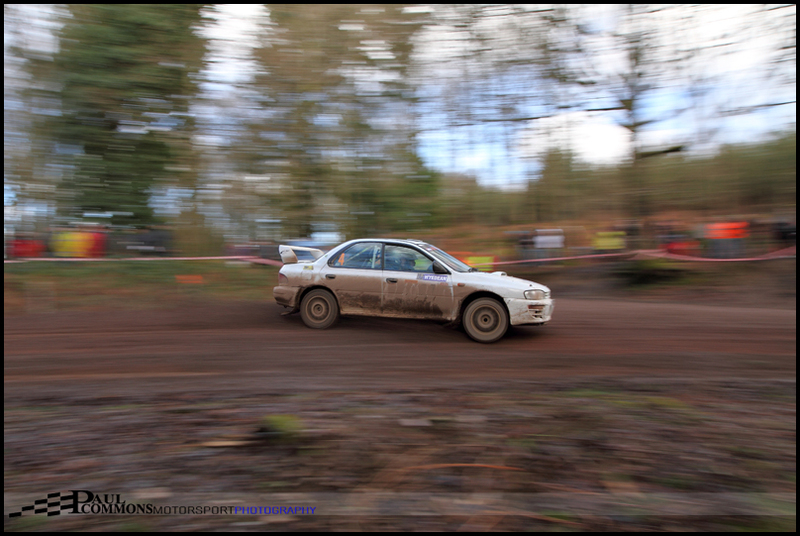 Jim McNeil was having a superb drive and maintaining third overall in his B13 spec Subaru. 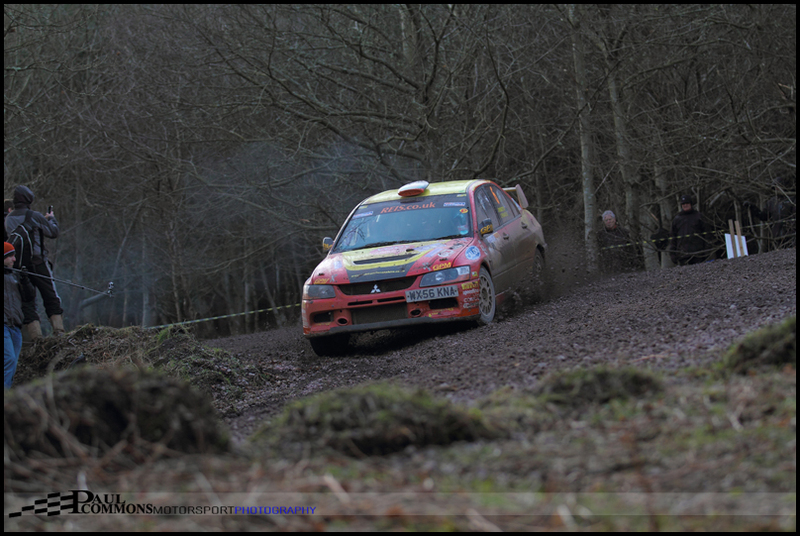 Whilst 2nd in B13 and 4th overall were Mitsubishi crew Luke Francis and John H Roberts. Matthew Robinson was leading the historic class by 40 seconds with 9th overall and Mat Smith was upto his usual giant killing antics with 13th overall but only 12 seconds in front of close rival David Bennett. 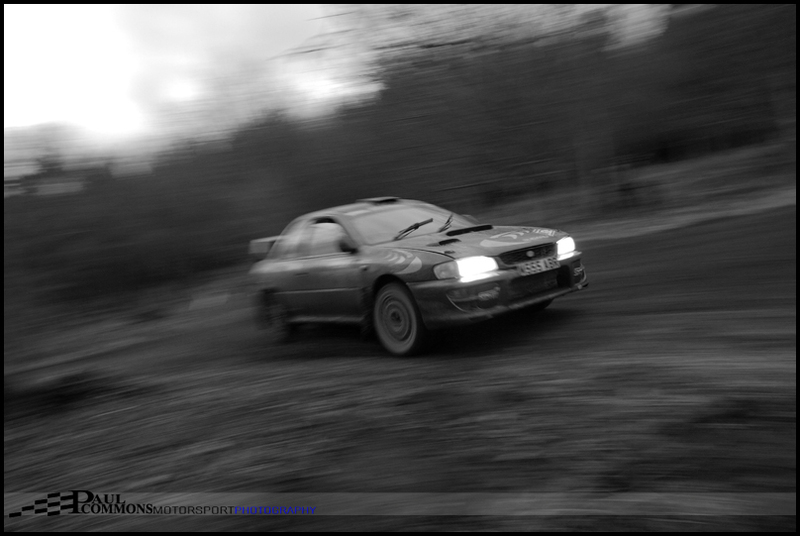 The downhill hairpin at junction 30 of Serridge was our choice for the afternoon loop of stages. Pleasingly the risk of further rain seemed to have faded allowing more variety of shot choice. We had been to this location before when it was run in the opposite direction but thankfully this time it was much more of a spectacle. Again the top 1400’s were the stars around here, fighting to keep the power on as they headed down to the open hairpin left at Junction 32. Before the crews reached us the battle for B13 was effectively over as early leaders Jim McNeil & Tom hughes were hit with a 2.5 minute road penalty. This left Luke Francis & John H Roberts free to claim the class honours and with it a fantastic 3rd overall behind the WRC machines of Bogie and Bird. 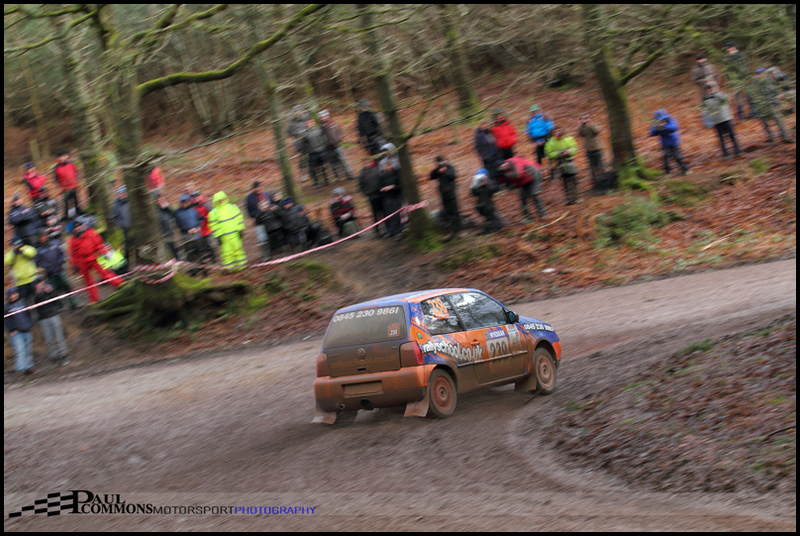 Ollie Mellors and Roland Llewellin were the main movers in the afternoon. 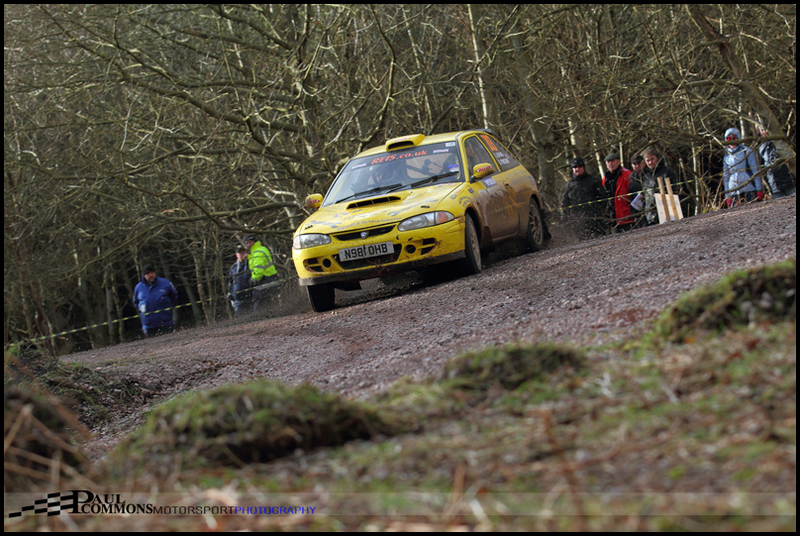 Mellors & Alex Lee moving from 7th to 4th in the crowd pleasing S2000 Proton and Llewellin and Jamie Edwards rising from 10th to 6th. The pair of them sandwiching the very impressive Russ Thompson & Andy Murphy who in turn claimed the group n victory. 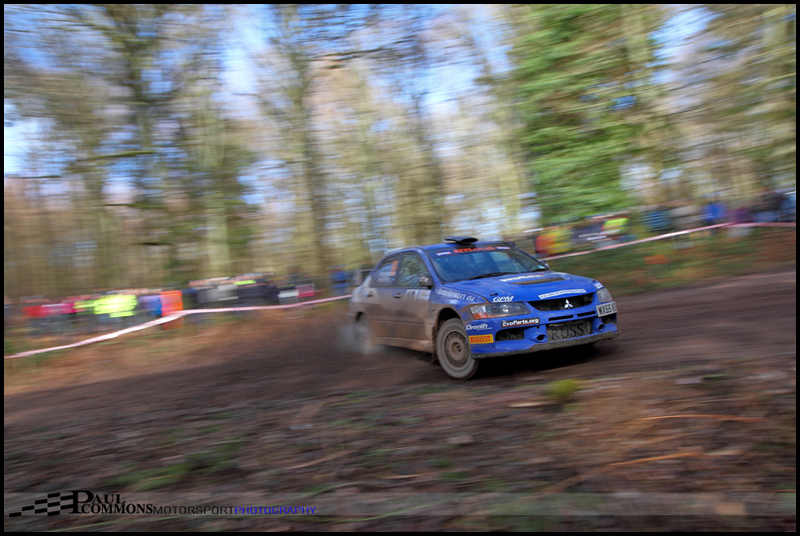 Jim McNeil would eventually take 8th overall with Rob Smith and Ross Weir 9th in the WRC impreza. It was a blue oval lockout of the historic class podium where Matthew Robinson and Sam Collis managed to maintain their lead and take a sensational 7th overall. The winning margin rising to well over a minute by the end of the event. 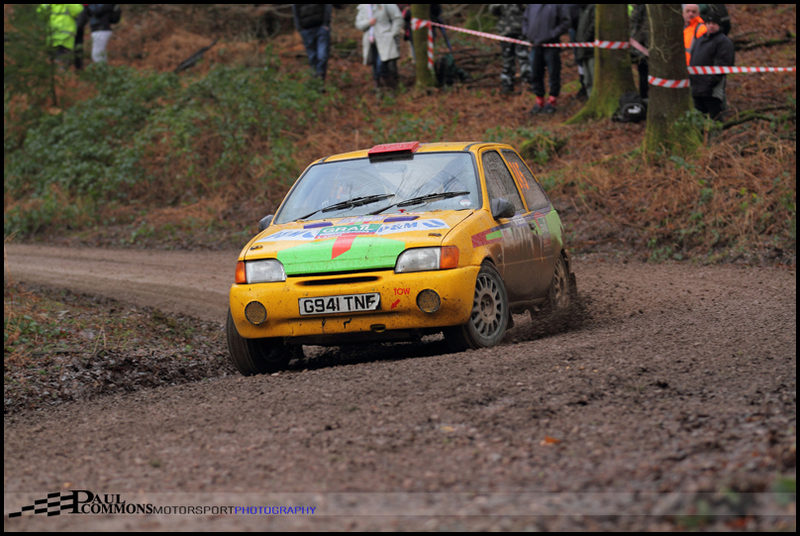 Theo Bengry & Les Forsbrook put in a solid performance themselves to claim 2nd in class and 15th overall. 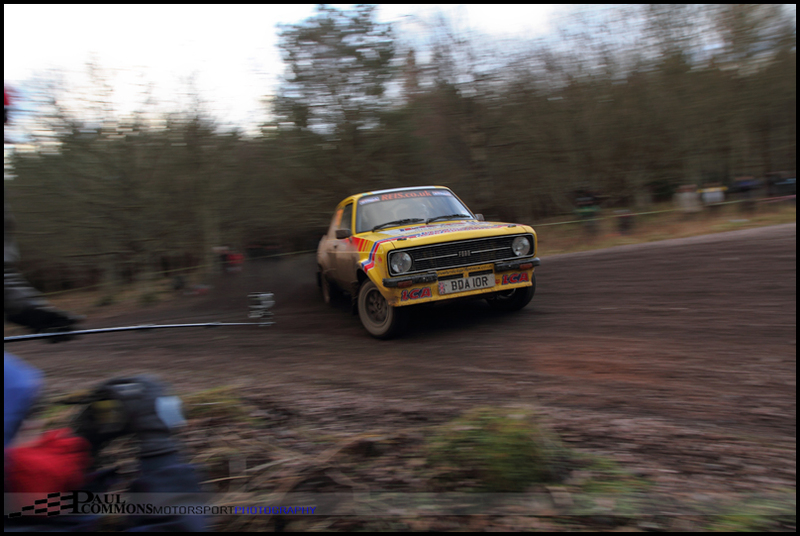 Whilst the third historic crew home were Rob Dennis & Simon Rodgers in their similar MK2. 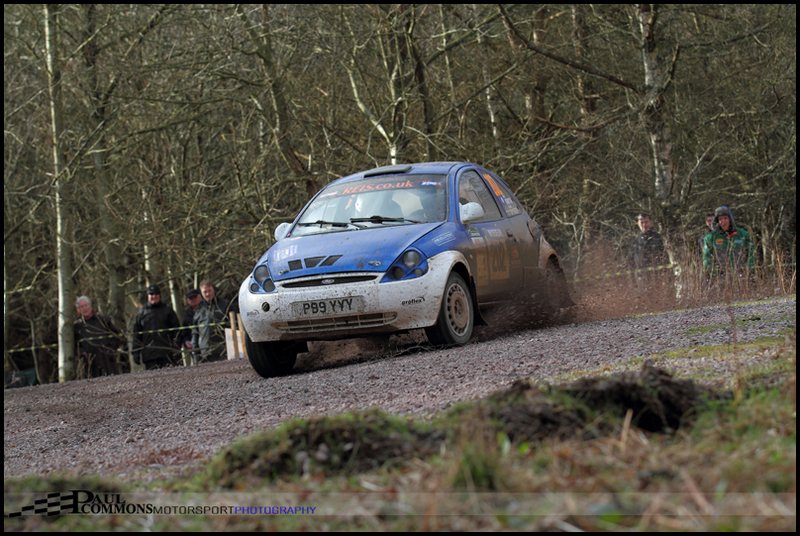 David Bennett & Alastair McNeil would rue the time lost on stage 1 as the Ford Ka of Mat Smith & Giles Dykes would take the class win by a mere 14 seconds. 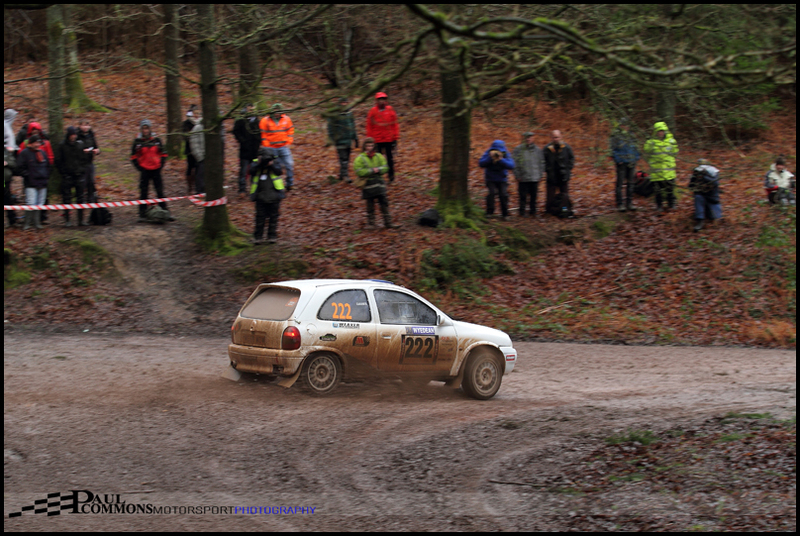 Darren Pinchin and Karen Jenkins would take third in class in their Proton Satria with 24th overall. This could be one hell of a year for the smaller engined machines. All in all it was a great performance from David Bogie and Kevin Rae. To take victory by over a minute from Paul Bird’s newer machine, over just 45 stage miles, is pretty impressive. It would be a great spectacle if he and keen rival Thorburn were to contest the whole championship season. As fans we can but hope …. Dad would have to wait until gone 6 before he got his overdue ‘cuppa’ due to afternoon delays. Inadvertently this did however allow for the odd shot in the dark. As usual we were one of the last cars to the leave the car park. And following the traditional stop at Mitcheldean chippy it was time to head back towards the M50 and home. 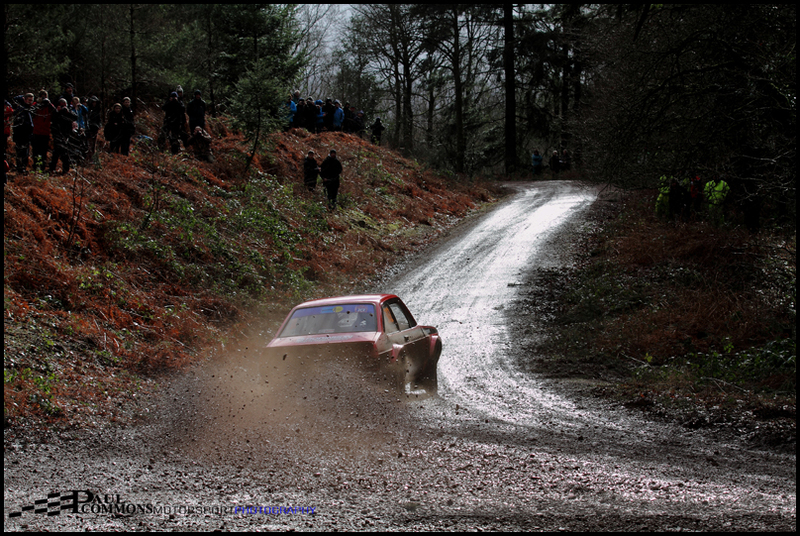 We will have to wait until the Somerset stages for our next fill of BTRDA action but before then there is the excitement of Pikes Peak downhill on the Mid Wales Stages. Roll on 2nd March …. For full results see the BTRDA website.